I don't like all the pre-made Suggested Stories on my Android. How can I remove them from RealTimes? Can I turn this feature off? Suggested Stories are created automatically and cannot be turned off. 1. Open the Suggested Stories view. 2. Tap the three dots at the top right of the app. 4. Tap the checkmark on the corner of each Story you would like to hide. 5. Tap Hide Story again at the top of the screen. 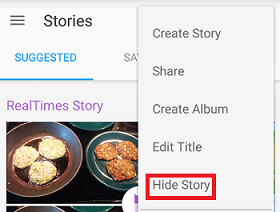 To unhide Stories, go to the app's Settings > Privacy and tap on the number of Hidden Stories. Select the Stories you want to unhide, then tap Unhide at the top of the screen.